The Beyerdynamic DT 2 is our standard stereo headset (in other words, our conventional tour guide system rental package comes with the DT 2. It combines maximum wearability with powerful, very natural-sounding voice reproduction. The DT 2 was designed to be used with our Synexis tour guide system's receiver (->Beyerdynamic RP8)... and that makes a difference in what you hear. Optimised for the frequency range of the human voice, the DT 2 delivers clear, natural-sounding speech, even at high volume. Lightweight at only 49g, the DT 2 rests comfortably on your head; even on long group tours or at conferences (listening to an interpreter, for example), you'll hardly know you're wearing it. We carry a wide range of interpreting/conference equipment (like our Beyerdynamic microphone units), so we frequently rent our tour guide systems to organisers of conferences and conventions. Because it’s so easy to wear, the DT 2 really shines at events like these, remaining comfortable through long lectures or panel discussions. The DT 2's powerful 104 decibels of sound pressure guarantee superior speech intelligibility, even at busy trade-fair booths and on most factory floors. We frequently rent the DT 2 to automobile manufacturers, for example. Outside or indoors, when they're using the Beyerdynamic DT 2 headset, your listeners will understand every word. Typical uses: museum tours, sightseeing, Segway tours, bicycle tours, events of all kinds. Connector: 3.5mm stereo jack (aka "Walkman jack" or "mini jack"). Frequency range: 40 - 20,000Hz. 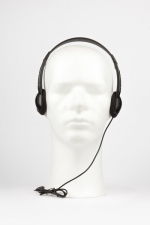 We recommend the Beyerdynamic DT 2 stereo headset – as part of our Synexis tour guide systems – for use in all sectors. We'll be more than happy to advise you about alternatives to the DT 2, like the Beyerdynamic DT 1 or the Beyerdynamic DT 3. What's more, our tour guide systems are highly flexible and can be used with the most common headsets. A tested freshly disinfected DT 2 stereo headset comes standard with our RP8 pocket receiver. Foam earpads are replaced after each use. Our team is happy to answer any questions you may have about tour guide systems or conference equipment. Phone: +49 30 29381970; e-mail: mail@Radio-Rental.com.